I think AIR may have potential as an alternative to Adonis Campaign, Launch Campaign, Private Contracts, The Root, and Worlds Plaza as a recurring-economy engine for Blue Sun. It must be rezzed through the runner's entire turn in order to recoup the money you get off it, unlike Adonis Campaign where you only need to pay to rez it right before you pick it up. Its returns diminish the more ice you put in front of it (since you'll have to pay the install cost), whereas Adonis will always be three credits for a click. As an Upgrade, can't be retrieved with Executive Boot Camp. Zero influence. And unlike Pri-Con, gives three credits per click. Setting aside the cost for rezzing it, which can potentially be recouped by picking it up, guarantees the three credits for the click, whereas Adonis only pays out the money if the runner doesn't trash it. Upgrade, so it can be installed anywhere - on top of existing assets, in scoring servers, or even in central servers - where Adonis needs to have its own quiet little space. This also means AIR synergizes much better with The Root, since you don't have to protect two separate remote servers. If you're willing to accept the diminishing returns, can pay out on additional installs in the same turn, where Adonis Campaign will never earn you more money than three credits per turn. I don't know which is better, but it's worth testing. 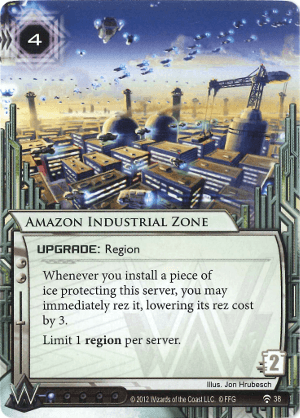 I love the idea of this with NEXT ice and The Foundry: Refining the Process. A big part of the problem with NEXT ice can be getting enough of them rezzed quickly enough to boost the collective power. This allows you to force-rez NEXT ice, and then draw another one to continue the process next turn.